Oil Control Face Wash: 50 ml. 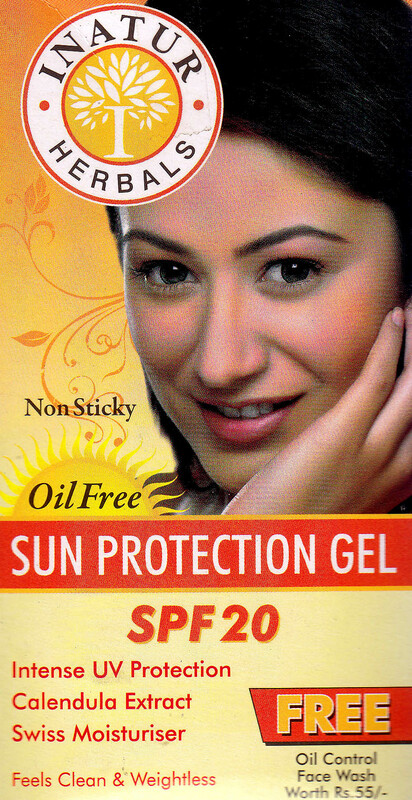 Inatur Sun Protection Gel SPF-20 is a breakthrough in sun protection. It protects with advanced broad spectrum UV protection and provides a ultra light non shiny finish. The non oily formula is enriched with calendula oil and swiss moisturizer and nourish the skin. Apply liberally before sun exposure. Reapply after swimming excessive sweating and towel drying. Intur oil Control Face wash. An innovative product from Rising Sun Research for people with combination and oily skin. It helps to open the clogged pores. It eliminates impurities accumulated dead cells and excess oil. •	Swiss Moisturiser: A Natural Scleroglucon is Anti inflamatary and reduces the formation of Sunburn.